While I didn't experience the predicted 25 knot gusts, the wind did keep things interesting at 2W5. We shared the pattern with a Citabria and, at least for a couple of laps, a Diamond Katana. Since the grass "taxiway" was closed, we formed a conga line when back-taxiing on the runway. After a passable three point landing, we moved on to wheel landings. 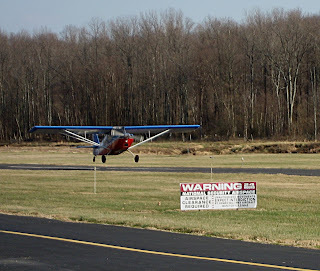 A wheel landing is performed by flying the airplane down to the runway such that the main wheels just kiss the pavement while the tail is still happily flying. Forward elevator is then used to stick the mains onto the runway by reducing the angle of attack. Otherwise, the momentum from touchdown will pull the tail down, increasing the angle of attack of the wings, thus causing the airplane to fly again (H. S. Plourde calls this a jounce). To make things easier, I was instructed to fly the approach faster than usual, diving for the runway threshold at 90+ mph. A proficient tailwheel pilot can make a wheel landing at the same approach airspeed used for a three pointer, but I'm not close to proficient, yet. It was shocking how quickly that extra energy dissipated, though: the constant speed prop on the Super Decathlon is an effective airbrake when in flat pitch. I still found it unnatural to put forward pressure on the stick at the moment of touchdown, and I'd jockey with the elevator rather than keep it steady forward--a bad habit that I will soon break. Several of my attempts resulted in bounces (jounces) with 3-point landing recoveries. It wasn't pretty, but I understand now what needs to happen and it is just a matter of making my hands and feet do it smoothly. While my flying was still sloppy, I felt like I made progress today. I was much more comfortable handling the crosswinds though the conditions were, admittedly, a bit tamer than last lesson. The instructor is awesome, and I plan to learn some basic aerobatics from him after the tailwheel endorsement. I can't think of a better way to accrue tailwheel time.